Capture in detail the historical architecture, unique heritage features and charming landscape of one of the capital's best kept secrets. Explore Edinburgh's West End with a sketch book in hand, using ink and watercolour to bring your visit to life. 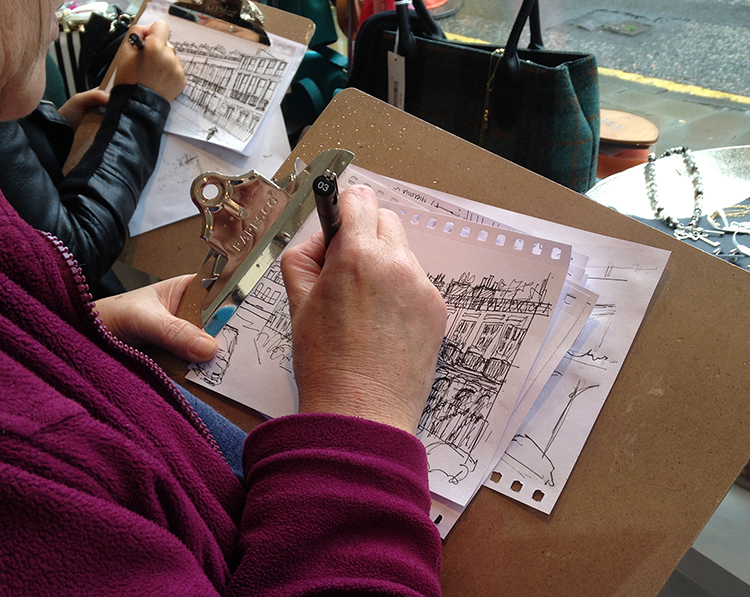 With helpful instruction from Mark Kirkham, an iconic local artist known as the Edinburgh Sketcher, you will quickly pick up sketching skills while increasing confidence in your own artistic ability as you wynd through cobbled streets, Georgian crescents and stylish shop fronts. All abilities welcome and encouraged! Join us for a walking tour along the Royal Mile in the heart of Edinburgh's historic Old Town. Our expert guides will take you to the hidden corners of this fascinating district: the closes and courtyards, the neuks and crannies and places that you might never discover on your own. We'll tell you about its history and especially about the characters and historical figures who have made Edinburgh what it is. All our guides are local people who love our city and are only too pleased to share their knowledge and enthusiasm with you. Our tours are completely free during the Edinburgh International Festival and Fringe. At other times we make a small charge. Explore, Discover & Enjoy Edinburgh with two self-guided, quirky, heritage walks with an optional treasure hunt. Are you curious about Edinburgh? Looking for an unusual and quirky activity which gets you out in the fresh air whatever the weather? Take one of our self-guided walks with a treasure hunt theme - looping around the better-known sights, as well as some of the more unusual and quirky ones, which combined make Edinburgh a fabulous place to explore! You'll get everything - detailed directions, maps, clues (with answers in the back! ), and interesting snippets about the history of Edinburgh and the people that have shaped it.